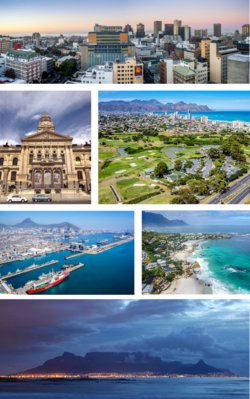 Cape Toun (Afrikaans: Kaapstad; Inglis: Cape Town; Xhosa: iKapa) is the seicont-maist populous ceety in Sooth Africae, an the lairgest in land aurie, formin pairt o the Ceety o Cape Toun metropolitan municipality. It is the provincial caipital an primate ceety o the Wastren Cape, as well as the legislative caipital o Sooth Africae, whaur the Naitional Parliament an mony govrenment offices are locatit. The ceety is famous for its harbour as well as its naitural settin in the Cape floral kinrick, includin such well-kent laundmerks as Table Muntain an Cape Point. Cape Town is an aa Africae's maist popular tourist destination. Locatit on the shore o Table Bay, Cape Toun wis oreeginally developed bi the Dutch East Indie Company as a victuallin (supply) station for Dutch ships sailin tae Eastren Africae, Indie, an the Far East. Jan van Riebeeck's arrival on 6 Aprile 1652 established the first permanent European dounset in Sooth Africae. Cape Toun quickly ootgrew its oreeginal purpose as the first European ootpost at the Castle o Guid Howp, becomin the economic an cultural hub o the Cape Colony. Till the Witwatersrand Gowd Rush an the development o Johannesburg, Cape Toun wis the lairgest ceety in Sooth Africae. ↑ Pollack, Martin (31 May 2006). "Achmat Ebrahim is the new city manager of Cape Town". City of Cape Town Metropolitan Municipality. Archived frae the oreeginal on 16 April 2007. Retrieved 25 March 2007. ↑ 2.0 2.1 2.2 2.3 "Main Place Cape Toun". Census 2011. ↑ 5.0 5.1 "Global city GDP 2011". Brookings Institution. Archived frae the oreeginal on 4 June 2013. Retrieved 18 November 2014. ↑ Africa, Statistics South. "Metropolitan Municipality | Statistics South Africa". www.statssa.gov.za. Retrieved 2016-06-02. ↑ "Agenda 21 Partnership Cape Town – Aachen". Retrieved 5 March 2010. ↑ "Cape Town". Haifa City. Retrieved 5 March 2010. ↑ "Agreement on the Establishment of Relations of Friendship between the City of Hangzhou of the People's Republic of China and the City of Cape Town of the Republic of South Africa" (PDF). 18 April 2005. Retrieved 5 March 2010. ↑ "Villes jumelées avec la Ville de Nice" (in French). Ville de Nice. Retrieved 5 March 2010. Wikimedia Commons haes media relatit tae Cape Town. This page wis last eeditit on 13 Februar 2018, at 22:28.